KATHMANDU, May 6: The CPN-UML and CPN (Maoist Center) are just days away from the final deal on unification, CPN (Maoist Center) Chairman Pushpa Kamal Dahal has said. On Saturday, while addressing a media gathering at his birthplace in Kaski, Dahal revealed that the two parties have already resolved disputes over power sharing and added that preparation was underway to sign the final deal. "Only some minor differences over the wording of the draft documents (statute and organizational documents) remain to be resolved. The work on the remaining issues will begin as soon as I reach Kathmandu," Dahal said. He said that the disputes over division of power were resolved during a one-on-one meeting held with Prime Minister and UML Chairman KP Sharma Oli on Thursday. Dahal's remarks come two days after he reached an understanding with Oli on sharing power in the party and the government. Though the exact details of the understanding have not been disclosed, leaders briefed on the issue said that the two leaders have agreed to rotate the leadership of the unified party and the government between them. But the leaders said that Oli and Dahal are still working to develop a model to integrate the committees of the two parties. There are some differences over the share of power each party would have in the unified party. The Maoist Center has been demanding a dignified share in eight executive committees of the unified party. Some Maoist leaders have claimed that both parties should have equal members in each committee, while few others have said that they are ready to show some flexibility on the number. On Thursday, Dahal had told party leaders that both parties would have more or less equal status in the eight executive committees. His close aides said that the Maoists have demanded 175 members in the 400-member strong central committee of the unified party. 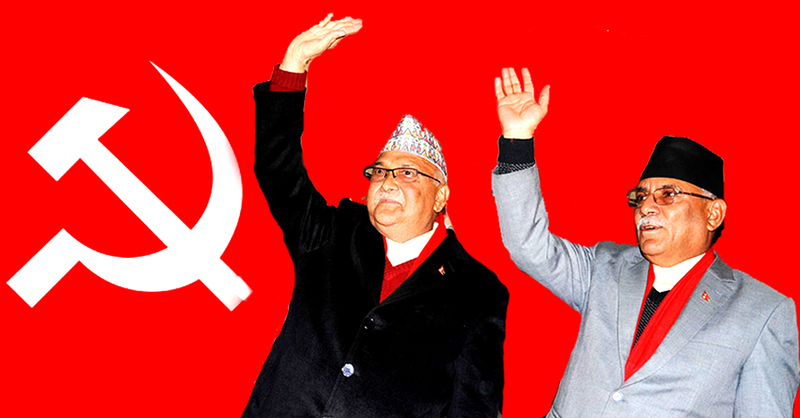 But UML rank and file has ruled out the possibility of more than 40 percent stake to the Maoist Center in the unified party. Despite Dahal's claims, second rung leaders of the two parties said that the unification could take at least a few weeks more. "We were planning to announce a new date for unification today (Saturday), coinciding with the birth anniversary of Karl Marx. But it could not happen due to some differences. It means that the merger will still take some time despite progress in talks," said a Maoist leader. The two parties were planning to announce a new date for merger on Saturday. Addressing a program organized to mark the birth anniversary of Karl Marx in the capital on Saturday, PM Oli also acknowledged the 'significant progress' in talks but conceded that some small issues were hindering the unification. "Technical and minor issues should not be allowed to linger," said Oli, adding that the unity between two parties was the only way to take the nation toward political stability, peace and prosperity.